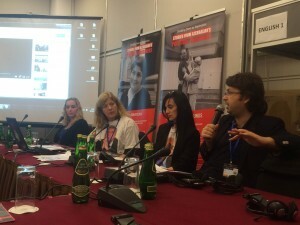 “It should have been Khadija Ismayilova speaking to you today,” said IPHR Director Brigitte Dufour when opening the side-event “Politically motivated persecution in Azerbaijan,” which IPHR and the Sport for Rights coalition organized in the framework of Civic Solidarity Platform at 2015 OSCE Human Dimension Implementation Meeting in Warsaw. She also said: “Today when the space of freedom in Azerbaijan is shrinking more and more, there are no human right defenders living in Baku who could safely speak about their country at this event.” “A year ago Khadija Ismayilova was one of the panelists at the HDIM; today her chair at this panel is empty.” There could have been many more empty chairs as a growing number of journalists, human rights defenders, lawyers and NGO activists are jailed in Azerbaijan. Rebecca Vincent, leader of the Sport for Rights campaign who spoke at the event, provided an overview of the alarming human rights situation in Azerbaijan. She stressed that pressure on civil society has not only not decreased in the recent period, but it has become more severe. Just recently, for example, Shirin Abbasov, a young journalist reporting for Meydan was sentenced to 30 days in jail on an administrative charge of disobeying police orders. For the first 30 hours of his detention, his relatives were not even notified about the arrest. Emin Milli, Meydan TV executive director referred to widespread charges used against activists in Azerbaijan and joked bitterly: “Now we know that all drug trafficking in Azerbaijan is organized by civil society leaders.” Emin has personal experience in this regard. Recently his cousin was accused of illegal drug possession, the brother of his wife was detained on the same allegations, and a relative of his fellow Azerbaijani journalist working in France was accused of drug trafficking in absentia. There are also many other cases when human rights defenders in Azerbaijan have been charged and convicted for alleged drug possession. To get the cousin out of prison, 23 relatives of Emin Milli were forced to write a public letter stating that they do not support Milli’s “anti-Azerbaijan policy” and exclude him from their family due to his “betrayal of Azerbaijan.” Many journalists working for Meydan TV in Azerbaijan have been persecuted. Their family members have also been intimidated and threatened with imprisonment. The Azerbaijani authorities also persecute people who cooperate with civil society leaders living in exile. Representatives of the government of Azerbaijan were also present at the event. Among other remarks, a government representative said that imprisoned human rights defenders should have thought about the impact on their families in the case of their imprisonment. Dinara Yunus, daughter of imprisoned human rights defenders Leila and Arif Yunus who was also on the panel of speakers, replied that she was proud of her parents and wished everybody had such parents. Dinara went on to describe the critical condition of the Yunus couple, whose health has deteriorated badly since their arrest last year. Dinara said that she is afraid that the trial against the couple, which ended with heavy prison sentences being handed down to them in August this year, could have been the last time that her parents — who lived together happily for 37 years — saw each other alive. She stressed that considering the poor health condition of her parents, they should be released on humanitarian grounds; otherwise their sentences in fact become death sentences. A concluding message from the side-event was that Azerbaijani civil society and international NGOs demand a stronger response from the OSCE, the EU and the Council of Europe to the crackdown on civil society in Azerbaijan. All possible measures, including personal sanctions should be applied to press for the release of political prisoners, including in particular imprisoned human rights defenders and journalists. See more pictures from today’s event on our Facebook page. Previous articleWarsaw protest: Release political prisoners in Azerbaijan!